The Ring-tailed Lemur has obtained its name for the long, fluffy tail with black and white stripes. 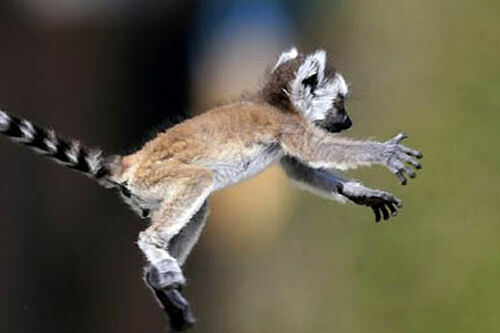 They are one of the lemur species endemic to Madagascar, which means only there do they live in the wild. They are very interesting animals, and as many natives know, they can emit a variety of sounds – squeaking, hissing, or even purring. These mammals reach a length of 39-46 cm, while the spectacular tail is usually up t 20 cm longer than that. The fur is metallic gray, with a whiter underside, while the face is white, with black spots around the eyes and the nose. The edgy nose is very sensitive, and serves a purpose of communication with the scent glands near the shoulders. The Lemur rubs the glands with the tail and puts the excrete on the forefeet. 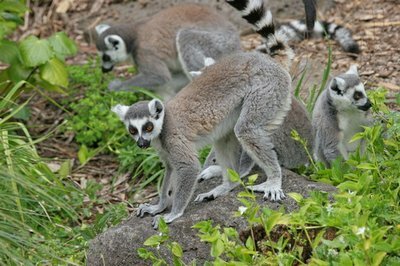 Ring-tailed Lemurs live in family groups, inhabiting open, bushy territories, even cliff areas. The group is made up of 5-30 specimen and both the sexes have separate hierarchies, while the group in total is lead by a dominant female. All the females are quite privileged in the group – if there is lack of food or water, they are the first ones to eat. Ring-tailed Lemurs are highly territorial, marking the borders of their territory with scent and not allowing any other lemurs in. These lemurs occasionally eat bugs, but as most of their kind, they’re mostly vegetarian. 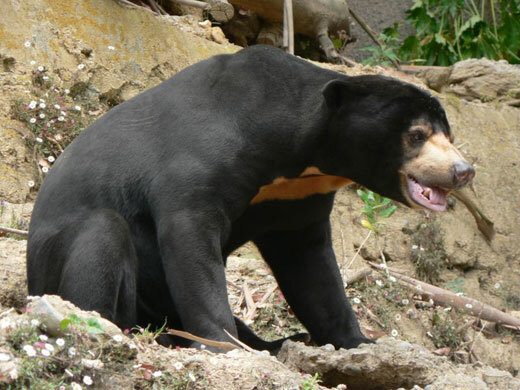 The animal eats a variety of fruits, being especially keen on bananas and figs. Ring-tailed Lemurs are very tidy animals and they are very careful not to get their fur dirty during the feeding process. Multiple times a day, the lemur cleans its coat with the comb-like teeth and the long toenails, keeping the fur in perfect condition. The Ring-tailed Lemur female is ready to mate only a few days in April. During the rut period, males gather around a female and perform an interesting fighting ritual – every once in a while a male excretes a very strong scent from the glands on the shoulders and waves its tail as a warning flag. A real fight usually follows, and the winner copulates with the female. After 120-135 days one or two pups are born. Immediately after birth the baby attaches itself to the mother’s belly fur, and the mother wreathes her tail around the offspring. They stay in this position for about two weeks, after which they move to the mother’s back. Three weeks after birth they make their first independent steps, although still remain near the mother for quite a long time. The young Lemur is fed milk for about five months, and all females in the group nurse the pup. 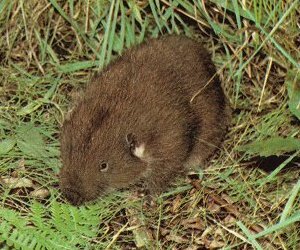 Six months later the animal becomes independent, and if they’re a female, they leave the group and try to form a new one, while males either stay or move to an existing one. The life expectancy in the wild is unknown, while in captivity, Ring-tailed Lemurs live for up to 14 years.